"This lasagna recipe is so easy, even a novice cook could master it! Even better, it tastes so good, your family will fight over the leftovers. If there are any!" In a medium skillet over medium heat, cook the sausage until brown and the juices run clear. Drain and set aside. In a small bowl, combine ricotta, egg, basil, thyme, garlic powder, oregano and half the shredded mozzarella. Mix well, and set aside. 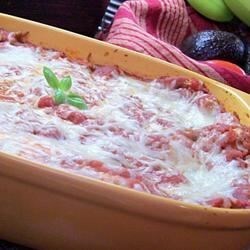 Coat the bottom of a 9x13 baking dish with a little of the spaghetti sauce. Place three noodles in the bottom of the pan, not touching. Spread a layer of the ricotta mixture, a layer of sausage, and a layer of spaghetti sauce over the noodles. Repeat three more times. Top with the reserved mozzarella and Parmesan. Cover with foil. Bake in preheated oven 30 minutes, remove foil and bake 15 minutes more, until golden and bubbly. The directions do not call for enough sauce. You will need to add more. I can't tell you how much more because that is based on personal preference. Overall the recipe came out tasting alright.